Following a number of tragic accidents that have befallen innocent holidaymakers on so called 'adventure holidays', the government has ordered an inquiry into standards of safety employed by tour operators. One of the worst offenders has been Ramrod Adventure Holidays. We secured an exclusive interview with the company's founder Milton Ramrod, in which he proved to be remarkably unrepentant. Milton Ramrod, your company promises 'a skydiving holiday with a difference'. Is that correct? It certainly is. At Ramrod Adventure Holidays we are very proud of the fact that all our package holidays offer something a little different. Our skydiving holiday is one that we are particularly pleased with, and it has proven to be very popular. I believe that the main difference between yours and similar skydiving holidays is that you don't offer parachutes? Essentially, yes. It's skydiving without the parachute - rather a novel twist, don't you think? We provide flippers, facemasks, breathing apparatus - in fact all the safety equipment usually required by divers. Then we take these people up in an aeroplane and push them out. I see. Is it dangerous at all? Dangerous? Good grief no! I've been running this holiday for over fifteen years and I've never been hurt once. Yes, but then you're not the one jumping out of an aeroplane without a parachute, are you? Isn't it dangerous for the people actually doing it? Well I think it stings a bit when they hit the ground. Stings a bit! Mr. Ramrod, I have it on good authority that this activity is extremely dangerous. You might think that. The fact is that while I have been running this offer I've had over four hundred customers and not one single complaint. You've had four hundred and twelve customers to be exact, Mr. Ramrod, and not one of them has survived. Well what do you bloody expect? We take people's money, dress them up like idiots then drop them out of an aeroplane. Of course they're going to die, any fool can see that. But don't you feel any remorse, Mr. Ramrod? Don't you feel guilty about leading innocent members of the public to their deaths? Now look, we've always been very up-front about what we do. 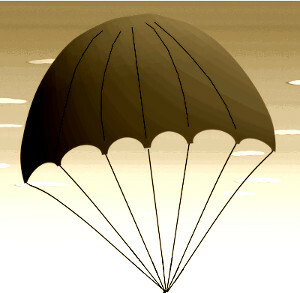 In all our advertising literature we make it quite plain that we do not provide a parachute. During training and on several occasions before the final jump we stress this point, and there is ample opportunity for the participants to change their minds. In this event we do, of course, offer a full refund. Well that's as maybe, Mr. Ramrod, but I honestly don't think I'd be tempted to take such a holiday, and I can't see many other people getting involved either. Ah well, you'd be surprised. It's a marvellous way to relax and probably one of the most exhilarating experiences that your money can buy. I'm sure that if you came along to watch one of our 'drops' you'd soon change your mind. I tell you, there's nothing more exciting than the spectacle of forty fully grown men and women plummeting to their deaths at ten metres per second squared, wearing nothing more than a wet suit, a diver's watch and a snorkel. We will be interested to see if the government report adopts a similarly cavalier attitude, and will bring any new developments to you as and when they happen.